OrionVM® (http://www.orionvm.com), a leading provider of wholesale Infrastructure-as-a-Service (IaaS) and next-gen cloud technology, announced today that Alex Sharp, OrionVM Co-Founder and CTO, has received the Hills Young Innovator of the Year Award in the Cloud category at the 2014 iAwards. The iAwards is Australia’s premier technology innovation awards program for the ICT industry. Alex and OrionVM CEO Sheng Yeo co-founded the company from a University of Technology Sydney dorm room in 2010. Together, they hatched an idea to build an IaaS company using a completely new technology blueprint. As CTO, Alex engineers and manages the innovations that keep OrionVM on the leading-edge of cloud computing. Alex drives OrionVM’s technical vision with a focus on simplicity in product design, and achieving extreme efficiency of the platform’s underlying architecture. The Hills Young Innovator iAward is a new addition to the Pioneer Domain of iAwards for 2014. The award recognises the most outstanding innovations from an individual 25 years or younger in three categories: Mobile, Big Data and Cloud. A $5000 cash prize was awarded in each category for the concept with the most innovative thought processes having the greatest potential for impact in the industry, irrespective of what stage of implementation has been achieved. The Hills Young Innovator of the Year was awarded to Elliot Smith (one of three winning entries) who received an additional $10,000 cash prize, taking the Hills Young Innovator of the Year winner’s prize money to $15,000 cash. The Hills Young Innovator of the Year is sponsored by Hills in alignment with their continued commitment to Australian innovation and inspired by the outstanding achievements of Lance Hill, who invented the Hills Hoist clothesline in 1945. Hills Chief Technology Officer, Leica Ison said that she was delighted the company famous for the Hills Hoist was spearheading and supporting innovation in ICT. “These young people have applied technology in clever ways to solve common problems. Their ideas and innovations are an incredibly promising sign of what’s to come for our sector,” Ison said. For more information on OrionVM, please visit http://www.orionvm.com. Details about the Hills Young Innovator of the Year iAwards and the list of winners and finalists in all categories are available at http://hills.iawards.com.au. OrionVM is a wholesale Infrastructure-as-a-Service (IaaS) provider. The company’s revolutionary technology suite (virtual storage, compute, orchestration and virtual networking) enables the delivery of high-performing, highly reliable cloud solutions at market-leading price-to-performance ratios. The OrionVM Wholesale Cloud Platform supports private, public, and hybrid cloud deployments and is built either for internal consumption or resale. Efficient and distributed enterprise-grade architecture allows clients to provide their own cloud offerings at margins of up to 80% off Amazon. Partners have full control—from a complete white-label rebranding to billing integration and flexible account management. OrionVM’s technical vision represents a fundamental advancement for Cloud 2.0 infrastructure, which inspired tech luminary, Gordon Bell, to become a company angel investor. Global customers include publicly listed telcos, IT service providers, and leading enterprise SaaS companies. OrionVM company headquarters are in Sydney Australia and in the San Francisco Bay Area. For more information, please visit http://www.orionvm.com or follow the conversation on Twitter @orionvm. iAwards is the premier technology awards platform in Australia delivering the most comprehensive program that recognises the achievements and innovation made in ICT across all facets of the economy. The iAwards program’s goal is to provide external stakeholders from business, industry and government with a clear view of the people leading ICT in Australia and the quality of innovation being produced. The iAwards honours both companies at the cutting edge of technology innovation as well as leading professionals across the industry. 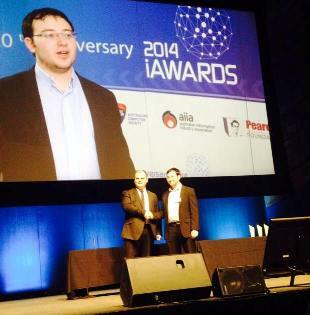 Most importantly, the iAwards honours the achievements of home-grown Australian innovators. For more information, please visit http://www.iawards.com.au or follow the conversation on Twitter @theiawards.